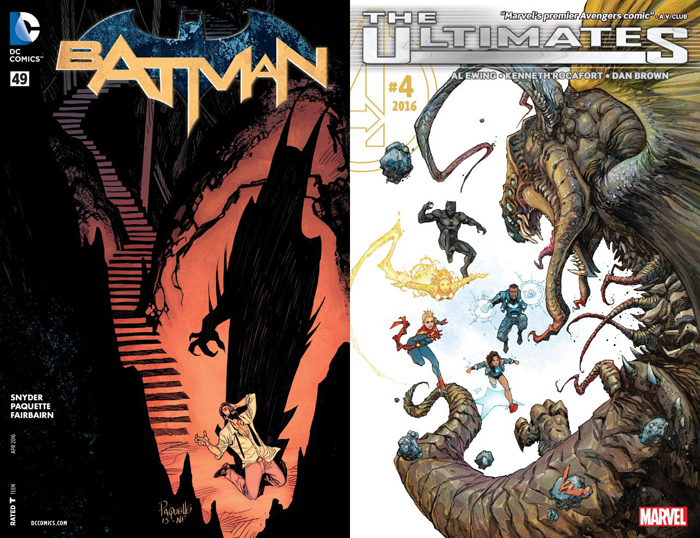 Home »Comics»Deadshirt is Reading: Batman and The Ultimates! Last time I reviewed Batman, I was a little displeased with the shift of focus from Jim Gordon’s Batman exploits to the semi-amnesiac Bruce Wayne. Two issues later and Gordon is nowhere to be seen, while Bruce has finally taken the inevitable steps toward returning to his old self. This week, though, I couldn’t be happier, thanks to jaw-droppingly gorgeous artwork from Yanick Paquette and Nathan Fairbairn, and clever, resonant staging of events by Scott Snyder. Issue #49 opens with Bruce Wayne’s admission of something he’s clearly known for a while: that he used to be Batman, and more importantly, that he needs to return to that life, to become that man again and save Gotham from Mr. Bloom. We’ve seen Alfred act as a surrogate father for Bruce in stories before, but here, it’s even more explicit, as Alfred sobs and begs his “son” not to do it. Snyder has done a great job of dancing around the comic book science elements of Bruce’s resurrection; all that matters is that Alfred has seen the man Bruce Wayne could have been if he wasn’t so tortured, and he can’t bring himself to damn Bruce to a life of being Batman again. The mind implanting machine is a similarly outlandish concept that’s used to illustrate deeper truths, and it’s where Paquette and Fairbairn shine. Bruce becomes Batman by living a series of constructed virtual realities that are essentially dreams of other Bat-lives. There’s a ton of gorgeous display work here, from a sandy desert Gotham to a gold and white future-pop Batsuit worn by Mayor Bruce Wayne. The sheer variety of lives lived by Bruce in this sequence is daunting, but Fairbairn differentiates them with ease, giving some a retro-futuristic vibe and others a pulpy grit. There’s a ton of great details, like the waterfall memorial in the multi-layer Batcave, and it’s striking that a lot of the versions of Batman work with his old adversaries to protect the city. In a perfect Batman world, everyone can be saved, and everyone will save each other. But the machine keeps failing, which brings us to the bitter truth of the story: for Batman to live, Bruce Wayne must die. Batman requires a complete selflessness, a single-minded focus on the mission. It’s why Gordon’s GCPD team, despite their valiant effort, couldn’t pull it off, and it’s why this healed version of Bruce has to be deleted. It’s a tragic idea, and there’s a part of me that hopes Bruce still emerges from the machine a more whole person, but it’s a strong statement in the strongest arc Snyder’s written yet. I don’t always agree with every choice Snyder makes, but they’re always well-executed, and regardless of how it ends, “Superheavy” has been a storyline to rival Miller and Morrison. This is the issue that finally clicked for me. Compared to Ewing’s other two books, the strict two-issue story New Avengers and the wacky Contest of Champions, Ultimates has felt both glacially paced and a little dour. I love the cast, and the threads Ewing has been following from Mighty Avengers, but it was missing that hook. This issue delivered everything I’d been waiting for and more. The history of Anti-Man, Blue Marvel’s best friend turned arch nemesis, is doled out nonlinearly, slightly reminiscent of the Dr. Manhattan bits in Watchmen. We see the accident that gave them their powers, Anti-Man’s slow descent into madness, and the final battle which took the life of Blue Marvel’s wife. His anger is raw and relatable. But when his son Kevin (omniscient cosmic being that he now is) arrives to stop him from murdering Anti-Man, it’s not as a guardian of reality, but as an ashamed son. A lot of comics deal with life and death as abstract mathematical concepts addressed in riddles. Ewing dispenses with all that and has Kevin point out that if Galactus, the devourer of worlds, is worth saving, everyone is. It’s a powerful rebuke of capital punishment and lethal force, the kind you see in the best Superman comics. Ewing takes a story of two men made of energy fighting in another dimension and turns it into something everyone on the planet can imagine and identify with. Ending Anti-Man’s life is ending the possibility for penance, justice, and any good that can come from it, and as a team that looks for a better way, the Ultimates need to be better than that. It’s heavy stuff, the kind of big story and idea that the book was sold on. And Blue Marvel is a character who could use some fallibility, as a Superman/Reed Richards pastiche and relatively new character. It was an exciting, visually dynamic issue (Gold Galactus!) and the first one where the heavy, thoughtful threads of the premise really came together.